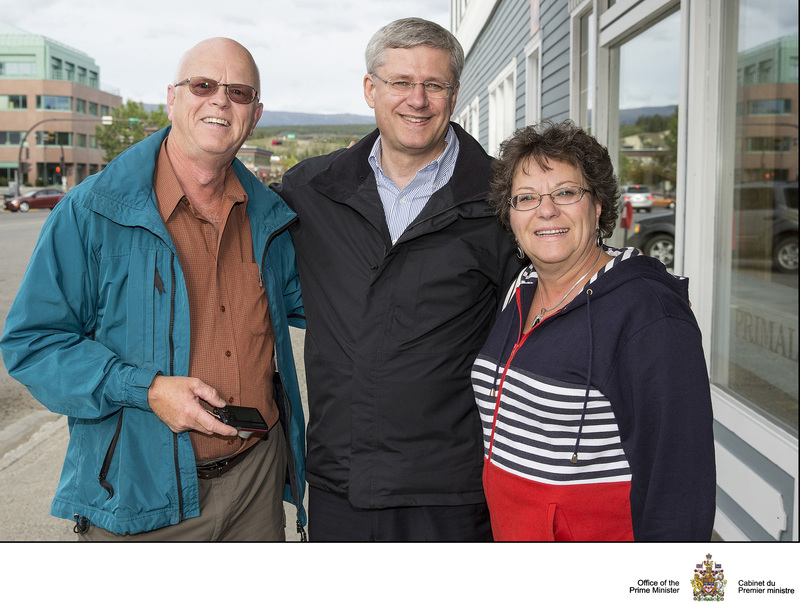 Prime Minister Steven Harper greeted Phil Ackland and his wife Therese this afternoon as they all arrived at the Gold Rush Best Western Hotel in Whitehorse. Mr. Ackland is in Whitehorse at the invitation of the Yukon Deputy Fire Marshal, Kevin W. Taylor. His mission is to train territorial and municipal fire officials on fire inspection and investigation of kitchen systems. Ackland a renowned expert in commercial kitchen fire safety gained the moniker Guru of Grease from his knowledge of the combustible residues that accumulate in restaurant systems. Mr. Harper is in Whitehorse on his annual trip to the North, to meet with the party faithful and local government officials to announce a new initiative for funding education. On the matter of personal security, Mr. Ackland mentioned that it only made sense that both of them were staying in the hotel at the same time as it saves taxpayer’s money. Again something Mr. Harper is deeply concerned with. Both parties will be continuing their travels around the Yukon in the coming days.